Last Updated: April 16, 2019 · Published: January 28, 2019 By: Asian Caucasian 20 Comments This post may contain affiliate links or sponsored content. I’m not Chinese. I’m not even Asian! But I’m obsessed with Asian food and that includes Chinese food (duh)! 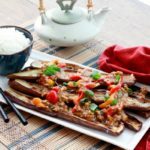 So, because it’s the “Year of the Pig” this Chinese New Year, I’m dishing up some awesome Chinese recipes to help you celebrate with me starting with this super tasty Chinese Eggplant with Garlic Sauce! 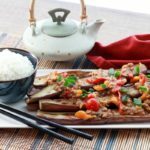 This super tasty Chinese Eggplant with Garlic Sauce dish that highlights Chinese eggplant is something you’re going to want to serve up all year round. 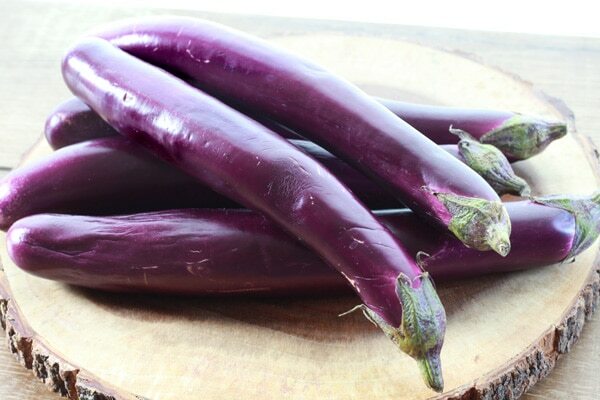 I found Chinese eggplant at my Asian farmer’s market (they’re long and thin). 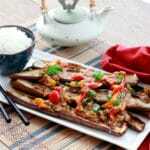 It is sometimes tricky to find Chinese eggplant so you can always substitute it with regular eggplant. 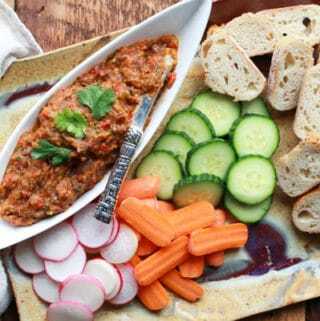 This flavorful sauce is made with low-sodium soy sauce, rice vinegar, sambal oelek (for a kick! ), garlic, bell peppers, ginger, ground turkey sausage, and chili bean sauce. Leave off the turkey sausage if you want to make this vegetarian. I charred the eggplant in the broiler and simply spooned this lovely sauce on top to serve. Such a pretty, easy dish for the Chinese New Year! “Guo Nian Hao” 新年快乐, as they say in China! 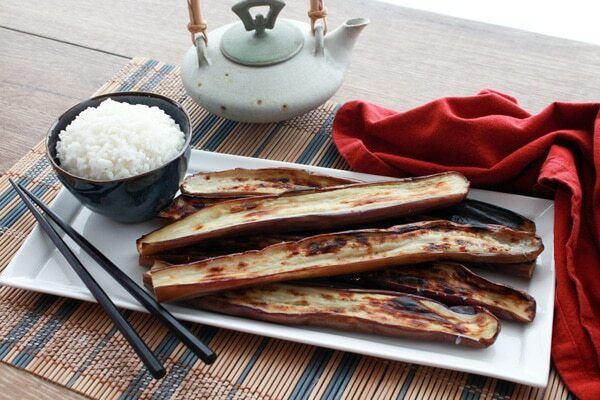 This gorgeous Chinese Eggplant with Garlic Sauce is the perfect dish to start off the Chinese New Year! In the oven, place a rack up high, about 10 inches from the heat, and preheat on broil. Cut the eggplants in half lengthwise and place the eggplants in a single layer on a baking sheet, brush with one tablespoon of the safflower oil and sprinkle with Kosher salt. 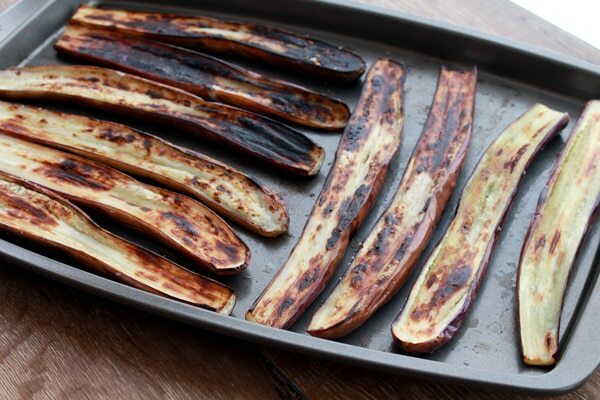 Turn the eggplant cut side down and broil in the oven for 12 to 14 minutes. 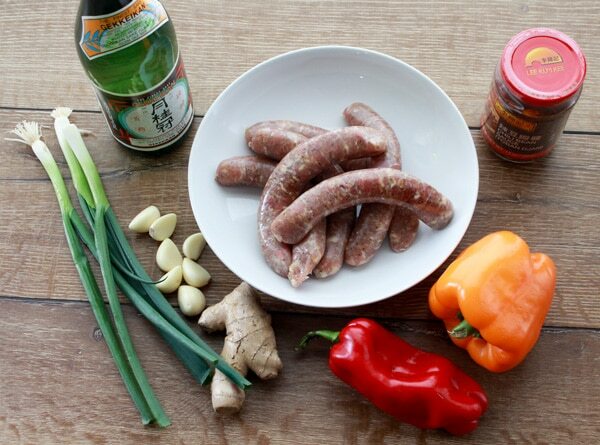 For the sauce you’re going to whisk together the soy sauce, rice vinegar, sambal oelek, and cornstarch and add in the minced turkey sausage, breaking it up and coating with the marinade. 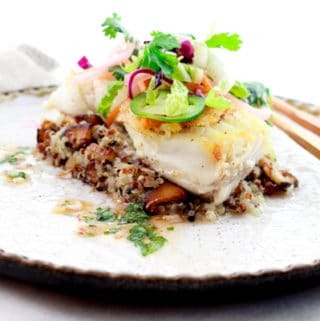 Then, in a medium bowl, whisk together the chicken broth, sake, sesame oil, honey, and chile bean sauce (you can find this at select specialty markets and Asian markets). Char the Chinese eggplants in the oven on the broil setting for 12 to 14 minutes. Using a large wok or heavy skillet, heat the remaining safflower oil on medium high heat. Add the minced garlic, green onions, red and yellow bell peppers, and ginger. Stir-fry until fragrant, about 2 minutes. Add in the sauce and turkey mixture and bring to a low boil, then simmer for 5 minutes or until thickened. Most recipes call for ground pork, but I wanted to lighten it up a bit and used ground turkey sausage. Look at these beautiful veggies to brighten up the dish! Spoon this gorgeous sauce over the charred Chinese eggplant for a beautiful presentation and a delicious dish for the Chinese New Year! Arrange the eggplant on a platter and spoon the garlic sauce mixture over the top to desired amount. Garnish with chopped green onions. Serve with a side of steamed white rice. WANT MORE? 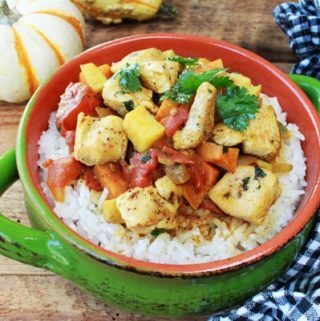 If you like this recipe, you’re going to love my Chinese Curry Chicken. 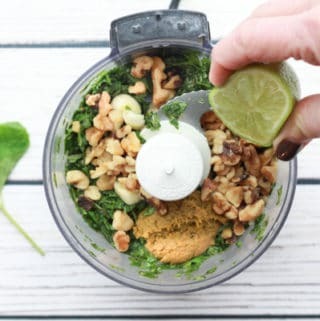 This looks like a healthy great recipe! Thank you, Donya! 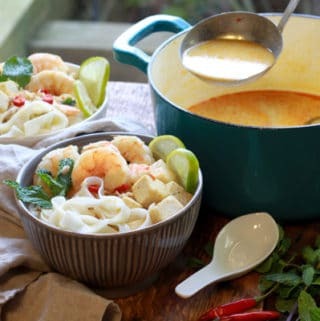 Looking forward to eating these flavorful dishes during the Chinese New Year! It’s super tasty! Hope you love eggplant as much as I do! 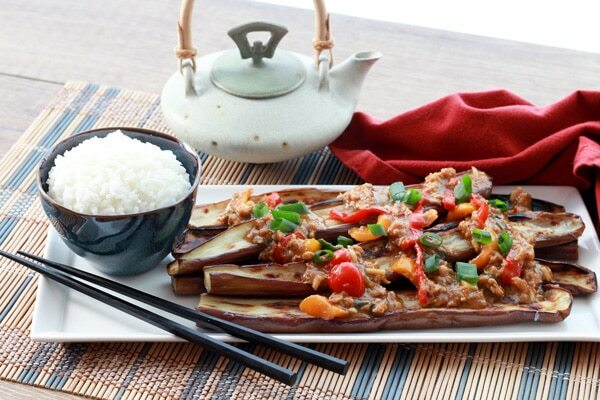 This Chinese Eggplant with Garlic Sauce sounds amazing. I appreciatethat we can nix the meat and opt for a vegan version as well! Definitely make this vegetarian. I’m confident that it will be just as good! 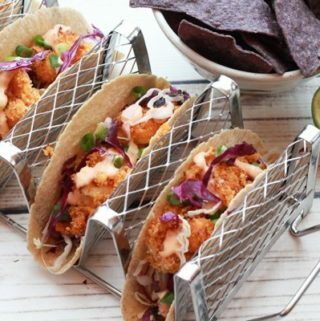 No meat necessary! 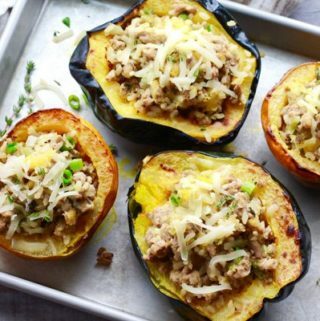 I’m a big eggplant fan and love the sound of all the flavors in this dish. A meal in itself! Yes, exactly! It’s so full of flavor. I’m a big eggplant fan and this sauce is the best! Oh, I really hope you can make this dish for your family. 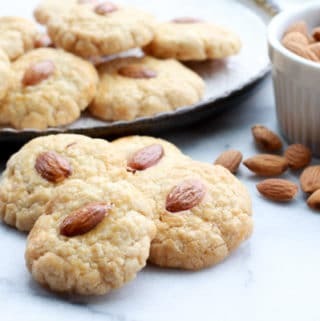 It’s really easy so delicious! I adore Chinese Eggplant! This sounds like such a tasty way to serve it! Definitely giving this a try! Thanks for the inspiration! Isn’t this a beautiful dish? Love this one for the Chinese New Year, but any time of year as well! THis looks amazing! I need to find some of those eggplants and give this a try. The flavors look perfect. Thank you so much, Julie! Regular eggplant will work just as well if you can’t find the Chinese variety. We can’t get Chinese eggplant at the stores here in my town, but I can drive down the mountain to get them! My family would really like this dish – so I’m going to look for them tomorrow!! 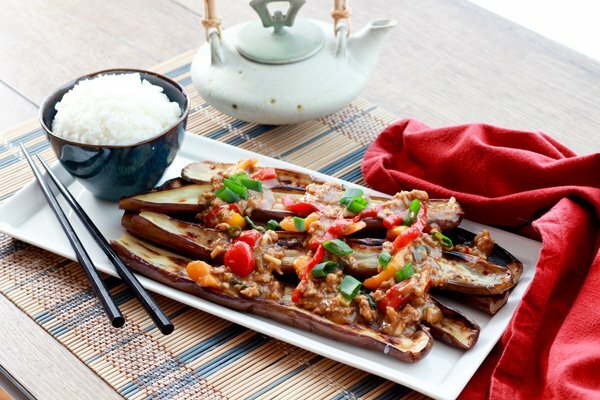 If you can’t find the Chinese eggplant variety, the regular eggplant will work just as well! 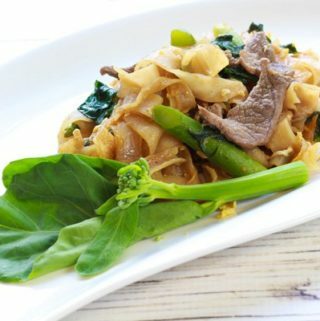 Hope you love this dish! Such a delicious dish to celebrate the New Year! Yes, I really love the flavors in this dish! Hope you enjoy it too, Liren! Happy Chinese New Year! 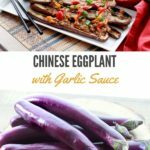 I’m obsessed with eggplant, so I’m loving these Chinese eggplants! Love the tasty sauce that you’ve made. Happy Chinese New Year! Yes! If you can’t find the Chinese eggplant variety you can always use regular eggplant. Pretty much the same taste. Can’t wait to hear how it turns out!